This afternoon, the Southeast Louisiana Flood Protection Authority filed suit against more than 100 oil and gas companies, seeking “many billions of dollars” to pay for the restoration of the Louisiana Gulf Coast. The lawsuit is already being described as historic and potentially game-changing, and for millions of Louisianians, it’s long overdue. Governor Bobby Jindal, however, issued a demand for the authority to drop its lawsuit, accusing its members of illegally conspiring with one another in order to enrich “trial lawyers.” As readers know, I’ve never been reluctant to criticize Governor Jindal, and to his credit, he makes it pretty easy. But I believe today, more than any other point in his two terms, Governor Jindal, who made his “demand” from a Republican retreat in Aspen, Colorado, forcefully demonstrated his utter contempt for the people of Louisiana and revealed himself to be nothing more than an arrogant, reckless wannabe plutocrat. I hope Louisianians finally see this man for exactly who he is and always has been. Louisiana has long been enchanted by the promise of the enormous reserves of oil and gas located off of its coast, and the oil and gas industry has long maintained a vulcan grip on Louisiana politics. Although oil and gas companies employ more than 50,000 people in Louisiana, the truth is: Louisiana is not a state rich in oil money; the profits go primarily to people in Texas, and the tax revenue goes into the federal treasury. The hub of Louisiana’s oil and gas industry isn’t New Orleans or Lake Charles; it’s Houston. And despite the countless hundreds of billions, if not trillions, of dollars in oil and gas that have been extracted from Louisiana’s coast, the state currently counts only two billionaires, Tom Benson, the owner of the New Orleans Saints and a man who made his fortune in car dealerships and banking, and Phyllis Taylor, who inherited her fortune from her late husband Patrick, the only man ever from Louisiana to make a billion dollars in oil and gas. For decades, Louisiana leaders have either operated under the illusion that they had the upperhand in this Faustian bargain with oil and gas companies or under the impression that oil and gas companies would just pick up their toys and leave if Louisiana lawmakers enacted additional regulations or levied more taxes. When Bobby Jindal ran for Governor in 2007, he often said in stump speeches that “Louisiana is a rich state.” Maybe this sounded good on the trail, but I always thought it was insulting and patronizing. Louisiana is poor, one of the poorest in the nation, and if you’re deluded enough to think it’s rich, then it’s probably because you only hang around with rich people. Of course, there is another way of looking at Jindal’s campaign pitch: Louisiana is rich in natural resources, which is undeniably true. Still, the question is and has always been: How does Louisiana ensure that it receives the full benefit of the riches of its resources? During the 2007 campaign, Jindal was running against Foster Campbell, a former State Senator and current Public Service Commissioner. Campbell had a simple, ingenious plan: Replace the excise tax with a 6% processing tax on oil and gas extracted in Louisiana and eliminate the state income tax. Campbell’s plan would have raised an additional $5.5 billion a year in revenue for the state, including $2 billion in discretionary spending. Earlier this year, Bobby Jindal attempted to repeal the state income tax, but unlike Foster Campbell, Governor Jindal didn’t want to replace that lost income through taxing oil and gas companies. Jindal sought, unsuccessfully, to replace the state income tax by raising sales taxes to the highest in the nation, a plan that would have shifted an enormous burden onto the poor and working class. At the same time Jindal was promoting his sales tax plan, he was also floating the idea of eliminating taxes on oil and gas companies altogether. Of course, money is not the only thing that the oil and gas industry has pilfered (and some may argue stolen) from Louisiana. Indeed, money isn’t the most important thing. For decades, Louisiana’s coastline, its barrier islands, and its marshlands have been systematically decimated by the oil and gas industry’s runaway negligence. The facts are indisputable. The science is clear. As any sixth grader in the state can tell you, Louisiana is losing a football field of land every hour. To be sure, the government’s decisions to divert water or build levees in certain areas have also contributed to the erosion of our coast and the destruction of our ecosystem, but there is absolutely no question that the oil and gas industry is contributorily negligent. Indeed, recent studies suggest that oil and gas companies are likely responsible for between 70%-90% of Louisiana’s coastal land loss. Noting that oil and gas exploration and development in Louisiana’s coastal zone began in the early 1900s and brought a century of profit to Big Oil, the suit contends that oil and gas production and pipeline companies “together dredged a network of canals to access oil and gas wells and to transport the many products and by-products of oil and gas production. The suit claims that the network of canals and channels have killed off vegetation, inhibited sedimentation, eroded coastal lands, and generally caused or accelerated coastal land loss. “Oil and gas activities have transformed and continue to transform what was once a stable ecosystem of naturally occurring bayous, small canals and ditches into an extensive — and expanding — network of large and deep canals that continues to widen due to Defendants’ ongoing failure to maintain this network or restore the ecosystem to its natural state,” the suit alleges. “That canal network continues to introduce increasingly larger volumes of damaging saltwater, at increasingly greater velocity, ever deeper into Louisiana’s coastal landscape and interior wetlands. The suit also alleges that “additional, ongoing oil and gas activities” continue to contribute to coastal land loss. Those activities include road dumps, ring levees, drilling activities, fluid withdrawal, seismic surveys, the use of marsh buggies, spoil disposal and dispersal, watercraft navigation, impoundments and propwashing/maintenance dredging. First, remember, the only way these lawyers would make money is if they win; the authority signed them on a contingency fee arrangement. So this “trial lawyer” rhetoric is just red meat for ignorant conservative reactionaries. You know, people who think it’s perfectly acceptable for a stranger from Texas or London or Riyadh to make billions of dollars plopping down some cheaply constructed, unregulated steel rig in the ocean, hiring a few kids who’ve never had the chance to attend college to live in the middle of nowhere to do the work for them, and pumping out the resources we all share… but if a group of lawyers make money only after proving to a court of law that these billionaire businessmen engaged in widespread negligence resulting in the destruction of an entire ecosystem, somehow, the lawyers are the ones exploiting the system. Today, Governor Jindal made it clear whose side he’s on. He made it clear that he disdains science, that he has nothing but contempt for public interest law and environmental justice, that he believes the federal government should pay for the negligence of private industry, and that the people of Louisiana are stupid enough to believe that this landmark, historic lawsuit, a suit that has already involved dozens of people working thousands of hours for free, is really about lawyers making money. Edwin Edwards went to jail for accepting $400,000 from Edward DeBartolo, who had hired Edwards (after he left the Governor’s Mansion) to help him secure a license to open up a casino in Louisiana (which he ultimately did not receive). There were other sneaky and troubling things that came out in the trial that sent Governor Edwards to jail for eight years, but the bulk of the case against him was about DeBartolo, who received immunity in exchange for his testimony. So while legal experts and the national media consider the very real possibility that Louisiana may actually prevail in this lawsuit against the oil and gas industry, that Louisiana may very well stand to gain many billions of dollars in damages, it’s worth noting: Bobby Jindal has raised millions from the oil and gas industry, more than any other industry by far, and unlike Edwin Edwards, Jindal’s raising this money while still living in the Governor’s Mansion. He’s already considered eliminating taxes on the industry, and now, he’s attempting to prevent a lawsuit that would finally hold the industry responsible for their negligence. 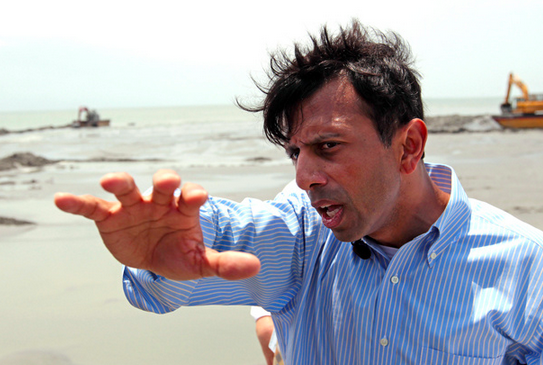 If it wasn’t already clear who Bobby Jindal thinks he works for, it should be now. Absolutely the best commentary you have ever written. Thank you. It is becoming clear Bobby Jindal is the most disappointing governor in our history. Hopefully the Authority will go tell The Governor to go jump in the lake (or one of those canals) ! Excellent piece Cen. It’s been evident for some time now that lil Bobby has no interest in the welfare of the citizens of this state. As his chances of being the nominee of the Republicans for President grow dimmer and dimmer watch as he moves further and further to the extreme side of that party. Of course that won’t help him in the least as he toes the lines given by his masters, ALEC and the Koch Bros.
And this clown of a governor thinks he could be the president of the entire country? Holy crap, the arrogance it hurts! Lamar, another “gift” granted the oil industry in the legislature this year is found in HB-549 an amendment to the 1994 Horizontal Severance Tax exemption. HB-549, introduced by Major Thibaut, R-New Roads and signed into law by Jindal, amends the original 1994 act to allow “existing” production, ie, production that has already utilized the two year exemption, an additional two year exemption from paying Severance Tax on production. Yep, that’s right. A legislature, “supposedly” so concern with raising revenue in order to avoid devastating cuts to Louisiana’s poor, by virtue of passing this amendment literally gave away hundreds of millions of dollars in state revenue to the oil industry. HR-549 established benchmark pricing dictating 100% severance tax exemption on horizontal production of oil selling below $70 a barrel and natural gas selling below $4.50 mm-BTU-tell me the oil lobbyist didn’t do their homework on these levels. From this price level, HR-549 establishes four additional price levels from which the amount of severance tax paid is inversely proportional to the established price level. For example, at the second price level for oil, $70-75 per barrel, only 20% of the calculated severance tax would be due. One hundred percent of severance tax is “not due” until the price of oil exceeds $100 a barrel, a level about as realistic as me being elected pope. The effect to state revenue can not be understated. Severance tax revenue from oil and gas production will “revert” to the level paid when horizontal production first “enjoyed” the exemption, ie 2009-11. Ultimately, this “amendment” will cost Louisiana hundreds of millions in lost severance tax revenue. But whose counting? Obviously not Jindal, trying to “pimp” his way into the White House, not Major Thibaut, representative from the heart of the Tuscaloosa Trend, and definitely not the state legislature, who overwhelming voted in favor of its passage. Kind of gives one the feeling that someone is urinating on your feet and blaming it on the rain.